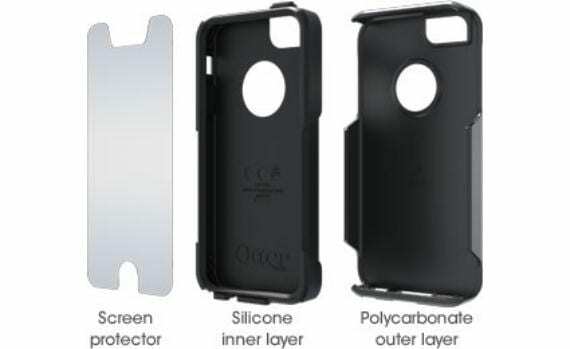 A week ago we could test the Otterbox Defender case for the iPhone 5 , one of the most protective cases for the iPhone there are 3 layers of Protection, incuyendo a hard case and a soft silicone. Protecting the screen from scratches, dust protected, falls, etc.. But it had a defect, it is quite thick and adds weight to the iPhone, and its price is 45 euros. Her younger sister, the Otterbox Commuter solves those defects found, in exchange for something less protection, but more than enough protection for 90% of users. Commuter offers two protective layers, in this case the interior is made ​​of silicone, with a considerable thickness to absorb falls and an outer layer of rigid plastic which gives strength to the assembly. In addition to being rigid breaks out as no other silicone sleeves or feel so uncomfortable that has rubber. So you do not stick to the pants pocket. For the screen has no integrated screen saver as the Defender, but it takes a screensaver apart, included in the pack. In my opinion this is more comfortable, because you can stick the protector on the screen and remains as one element in the Defender to be separated is a small gap that makes it not so convenient to use the screen. Protection is lacking for the Home button, but instead leaves the entire front view, so the appearance is more like the iPhone with nothing, not transformed. But if you have tabs for secure connections and headphone load below, just lift them to access. Meanwhile protect your iPhone from dust. It also has a rear opening for the camera and for you to see the apple. Otterbox Commuter case is a lightweight and discreet, not enlarged or thickened iPhone largely as with the Otterbox Defender, ideal for those people that they drop the iPhone frequently or who need extra protection in certain moments: out with the bike, go to the mountain, etc.. It is available in several colors and its price is 30 € in Octilus, which is its official distributor and somewhat less in online stores as amazon.es, etc. If you need extra protection for your iPhone Otterbox Commuter love you, if you need even more protection you can have a look at the Otterbox Defender we discussed a few weeks ago, and if you need extreme protection is next week we will teach a sheath Otterbox is about to leave, is waterproof, fully sealed. Article Review OtterBox Commuter: two layers of protection for iPhone has been originally published in News iPhone .